Joe Rizzuto – An Urban Hero! Below is a profile piece on Joe reprinted from the North York Mirror. Joe Rizzuto, left, and his son, Mark. The elder Rizzuto joined the Grandravine Special Program 21 years ago and has been president of the program since 003. 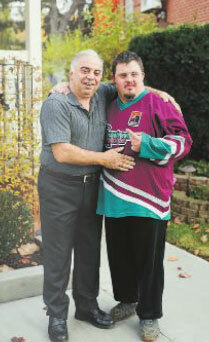 Joe Rizzuto first signed up as a coach with the Grandravine Special Program for people with developmental disabilities 21 years ago when his son, Mark, who has Down syndrome, wanted to play hockey. Soon, he was involved in fund-raising for the league. He then became a director before taking over as president in 2003 when founder, Patrick Flick, retired. There are now 95 players with the Grandravine Tornadoes, both male and female, ranging in age from six to their mid-60s, some of whom live in group homes. The Grandravine Special Program has inspired similar leagues in the United States, the United Kingdom, Norway and Sweden. Rizzuto does everything from booking trips, arranging ice time and making sure the players get out to practices and games, to fundraising, dealing with parents and making sure the players learn valuable life skills, said Dolores Evola, who nominated Rizzuto for an Urban Hero Award. “He’s the best guy I can think of. He’s amazing, what he does,” said Evola, whose 31-year-old son, Francesco, who is developmentally delayed, is involved in the league. The program has been operating out of the Grandravine Arena in the area of Sheppard Avenue and Keele Street, since 1980. Flick had a dream that ice hockey should open its arms to those with developmental delays. While the players’ challenges are a factor, the focus is on their abilities and the fulfillment and self-confidence they get from playing and making friends.